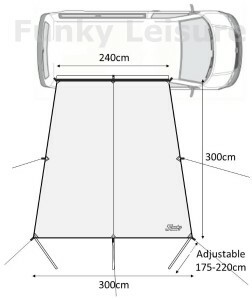 The original idea of a lightweight sun canopy awning specifically designed for a VW campervan first came to us while on a 5 week road trip around Europe back in 2003. Our 3,500 mile tour took us through 12 countries (including principalities) in our trusty green 79’ Bay. We didn’t mind too much putting up our drive-away awning when we stayed in one destination for a few days but found this a real drag to pitch when we were in one place for just a couple of days or overnight. 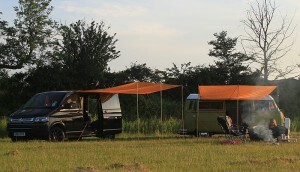 We were wild camping in the Camargue surrounded by brine lagoons full of flamingos when the VW Campervan Sun Canopy Awning was conceived. The Westy was hotting up inside and we just needed a bit of protection from the mid-morning sun to sit in the shade and eat… we decided then that the canopy needed to be simple, really quick to pitch and pack away… and most importantly, lightweight and compact enough to stow easily in the Bus. The idea quickly snowballed and we started adding additional features… the fabric needed to be waterproof and the design should allow rainwater run off… the canopy needed to cover a large area to offer maximum shade and shelter… the poles needed to be height adjustable with a choice of eyelets so the awning could be set up in lots of different configurations. On top of these neat features, instead of being just plain green or blue like all the other tents and awnings on the market at the time – the canopy fabric should stand out. 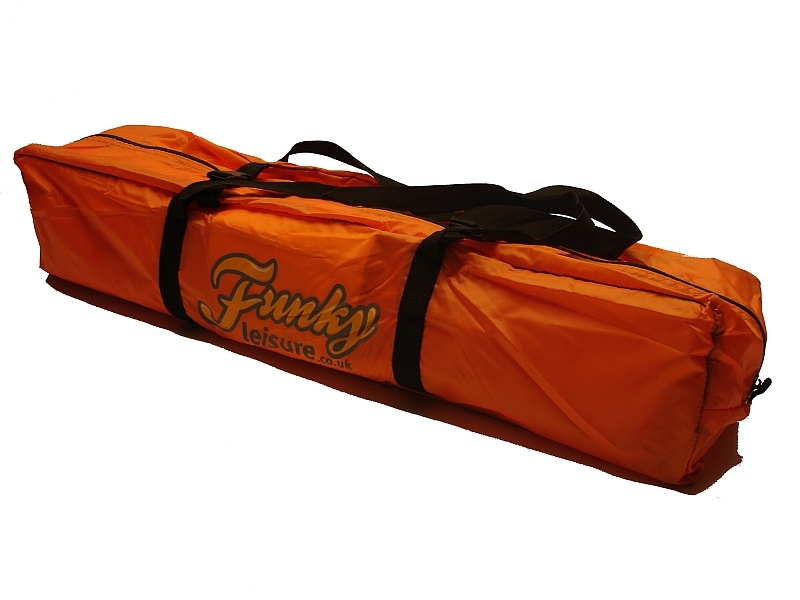 We developed the idea and a couple of years later started manufacturing and selling our first sun canopy awnings online at Funky Leisure. The first awning fabric designs were a digitally printed blue Op Art design and our classic Sunflower design which we also offered as lightweight windbreaks and 3 man dome tents. We have always tried to improve our awning design and the latest incarnation has all the original features plus added updates. The new trapezium shaped canopy fabric has been extended to 3m depth with 3m length at the front edge with 2.4m length at the van connection edge offering a 9m square area of sun shade and shelter from rain. Why trapezium? The 2.4m length connection edge makes attaching the awning to a SWB VW T4, T5 and T6 much simpler without to need to secure any excess loose material at the van edge. This length will also fit neatly onto the gutter rail of a VW Type 2 or Brazilian with a roof rack fitted. The addition of the connection edge guyline tabs with extra guylines and pegs allows the canopy to be set up as a freestanding shelter. 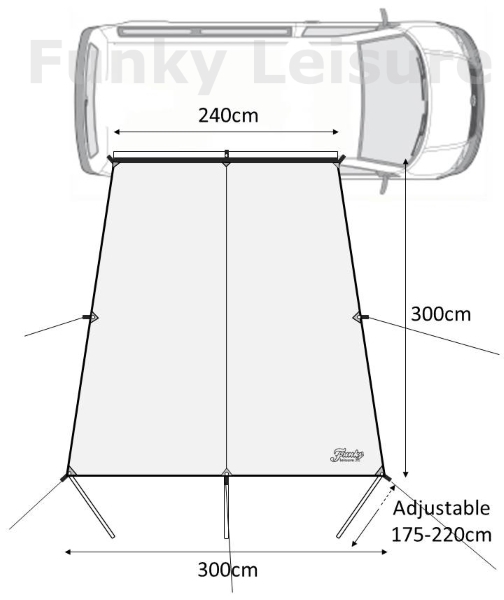 The awning can either be quickly pegged down at rear with a single pole at the front or second pole can be inserted into the rear middle floating eyelet to set the awning up in a ridge tent type style. This standalone feature allows camp furniture to be left under cover whilst you’re away from the campsite and also marks your pitch when you’re out for the day in your Bus. The canopy is supplied with all guylines pre-attached and bundled but if you don’t plan on using the awning as a standalone shelter or find the rear guylines are in the way, they can just be untied and stowed in the peg bag. If your canopy is connected via the Kador strip beading it will probably take two people to detach, one to hold the canopy fabric steady while the other one carefully drives the van out of position so the Kador can slide out of your C-channel awning rail. Please be very careful and don’t stand in front of the wheels if trying to carry out this manoeuvre as it’s easy to run over a foot… you’ll also find it really challenging (almost certainly ending in divorce) when you try to drive the van back into place whilst trying to thread the Kador beading back into the rail. We recommend using a 6mm to 6mm Drive-Away Kit. We recommend setting up the canopy with a single pole at front middle eyelet and the 2 x front corner and 2 x side guylines tensioned to form a ridge shape at the front. This ridge shape will allow rainwater runoff at each side of the canopy and is very stable in strong winds. If you have the canopy set up with 3 x poles at the front, with a bit of practice, it only takes a couple of minutes to loosen the front corner guylines, remove the corner poles and re-tension the guylines into this single pole shape. With the Funky Leisure canopy set up in this ridge shape you’re able to leave the side door open on your Bus and carry on sitting outside experiencing the sights, sounds and smells of nature during a summer shower. We have even dragged our compact BBQ just under the front of the canopy and carried on cooking with beer in hand whilst other campervan doors are slamming shut and awnings are zipped closed. *We strongly recommend setting the canopy in this shape overnight and whenever you’re away from the van as you never know when there’s going to be a sudden downpour and it’s sods law it’ll happen in the depths of the night or when you’ve just walked to the local pub or bar. Tip: When you remove the corner poles just stow them out of the way under the van for safe keeping. Supplied with 3 x height adjustable poles (175cm to 220cm) and with 6 x eyelets in the canopy fabric allows it to be set up in many different shapes either attached to the van or freestanding. The pole sleeve is made from heavy-duty silicone coated fabric to allow the pole to slide in and out easily even when wet. The canopies are currently available in Brilliant Orange, Chianti Red, Azure Blue, Anthracite Grey, Forest Green and Sierra Yellow – we also have a Black canopy on the way for autumn 2018. Happy Road Trips – Adventure is out there! Excellent website content. Just what I ended up being searching for! We have just bought an orange sun awning. The price was very reasonable and as I ordered it at 2.45pm on Thursday I never expected it to arrive in time for today’s camping trip. It arrived just after 9am today and the postage was included. 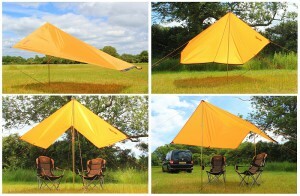 The weather has finally turned and we now need the sun canopy for the rain, perfect timing. Easy to set up, great quality and good quality pegs and guy ropes. Highly recommended product and an excellent website to boot. Thank you. Thanks Robert, great feedback! Hope you get plenty of opportunities to use the canopy for sun shade on future trips! !